Pressure cleaning is one of the most affordable ways to increase a home's value while at the same time restoring and extending its life by removing harmful dust, dirt, mold and mildew. 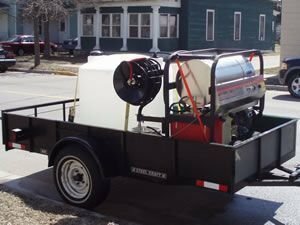 Journeymen Painters uses a hot water steam cleaning apparatus which is the best for any exterior painting. We work in a professional and safe manner. We take pride in our work which is prompt, courteous, and clean. Please call us at 608-792-5667 for a free estimate.